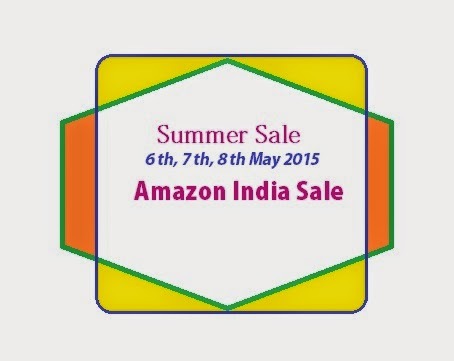 Amazon India's summer sale is happening on dates May 6, May 7, and May 8. Amazon calls it a "Great Indian Summer Sale". And they also claim that the deals will make you dance. UPDATE: Sale is Over, But Offers are still on. Checkout! As per all the leading newspapers, especially the first page, in the sale new deals will be available every half hour starting from 8 AM. Those who download the amazon app on their smartphone can benefit even more as the deals will go live 15 minutes early on the app. Consumers can further save money by SBI debit card because additional cashback of 15 percent on app and 10 percent on site is available when you buy products during the amazon.in sale of the summer. Kenstar AC 1 ton will be available for Rs. 20990 only. Yureka's smartphone will go for sale from 10 AM onward for just Rs.8999. One plus One phone will be available for just 21998 during open sale. 35 percent off on Nexus 9 tablet, will cost only Rs. 19990. Micromax Canvas Laptab would not only launch on opening day of sale but also will be available for unbelievable price of Rs. 14999. 25 percent off on Xbox One. 37 percent off on iPhone 5C. 30 percent off on Samsung S4. 30 percent off on Micromax A190. 49 percent off on Nokia Lumia 638. 35 percent off on Asus Zenfone 5. 74 percent off on Netgear wireless router. 50 percent off on Micromac TV 99 cms HD Ready. Sandisk 8 GB pen drive for Rs. 99 only. Energizer battery X.4 for Rs. 49 only. Skullcandy 2 x 1 Phase white headphones for Rs 999 only. Bedsheets for Rs 249 only. Symphony Air cooler 8 L for 3499 only (43 percent off). Also see: Deal of The Day. It's impossible to include every item in the list. But what a deal it is. Discounts, deals, and offers will be available on every product imaginable. This is a golden chance to save some money. Take advantage of Amazon India Summer Sale.